Sonam Kapoor's reception last night was star-packed. Literally. Did you see how glittery many of outfits chose to wear were? It was like half the people were trying to outdo the bride. Thankfully Sonam herself was wearing an Anamika Khanna lehenga with a twist, the twist being the chevron printed skirt. And she carried it off like a boss-lady. She looked quite stunning; especially with Anand Ahuja beside her. Many other celebrities looked quite good, even with their glitzy attire. They managed to stand out in the crowd of all the celebrities who were in attendance. Here is a list of all the celebrities who made it to the best dressed of the lot. Rekha with her stunning kanjeevaram saree. draped in that modish way, won our hearts. The pant-sari has been making headlines. The best friend also brought in her style game. Swara Bhasker looked fab in a Abu Jani-Sandeep Khosla outfit. The skirt worked for the entire outfit, and the accessorising was just right. Kajol in her grey Manish Malhotra saree and minimal makeup sent us back to Kuch Kuch Hota Hai (post-Anjali-transformation) days. Cousin Janhvi Kapoor wore a Manish Malhotra lehenga and she looked quite literally like a star, and managed to pull it off. 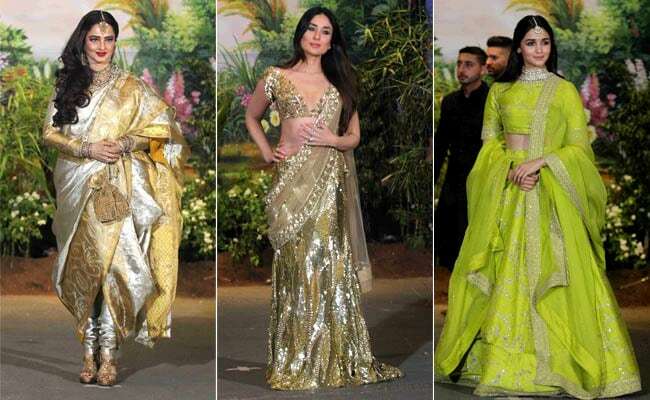 Looking very oomph was Kareena Kapoor in her Manish Malhotra gold saree and no accessories. Girls, take note. Kangana Ranaut in her Shah Gaurang saree was looking very pretty without trying hard at all. The saree itself was quite beautiful and so was the choker on her neck. Vidya Balan's kohled eyes and that Shah Gaurang saree made her looked very earthy and charming. Finally, it was Alia Bhatt's Sabyasachi lehenga which drew a lot of praise; she looked all kinds of cute and attractive. Full points! There you have it. And that's a wrap on the wedding of the season.